Why use a heat bed? Heat beds are used because they dramatically improve print quality by keeping the extruded plastic warm and thus preventing warping. 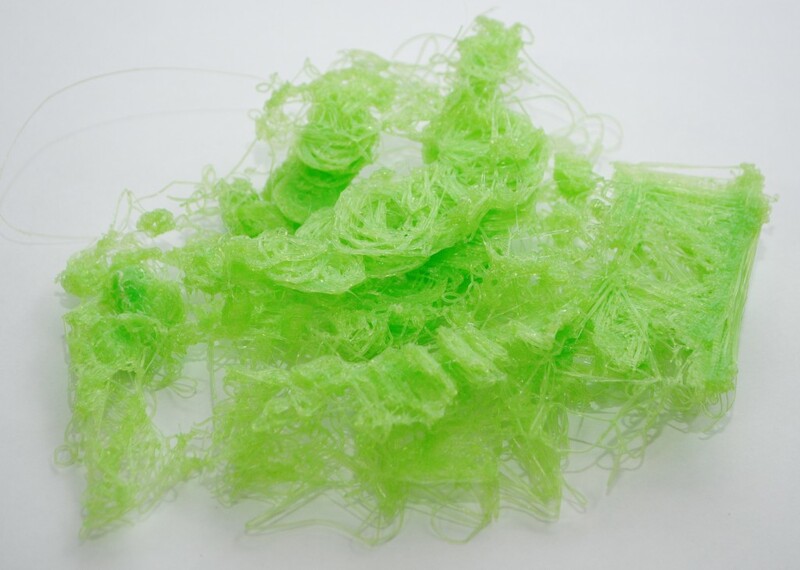 Warping is a common condition caused by plastic on the edges of the part cooling down at an uneven rate when compared to the plastic inside of the part. The result is that corners warp up and deform your model. Rafts are an effective ”no-heat bed” strategy to deal with warping when a heat bed is not available. In the past, techniques such as the raft (building parts on top of a ‘raft’ of material which is larger than the final part onto the build surface) were used to prevent warping by increasing the surface area of the part (and increasing it’s adhesion – thus fighting warping). Derived from the raft, mouse ears are a clever and effective technique to make sure that the corners of your prints are well secured to the platform and won’t lift. Although they offer greater adhesion by increasing the surface area for your part to grip onto the bed, they are not 100% effective without a heat bed. Sometimes the warping forces are simply too great and can overcome the mouse ears. Heat beds work to prevent this warping effect by keeping your part warm during the whole printing process which keeps the material at or above heat-deflection temperature (the temperature at which it is malleable). 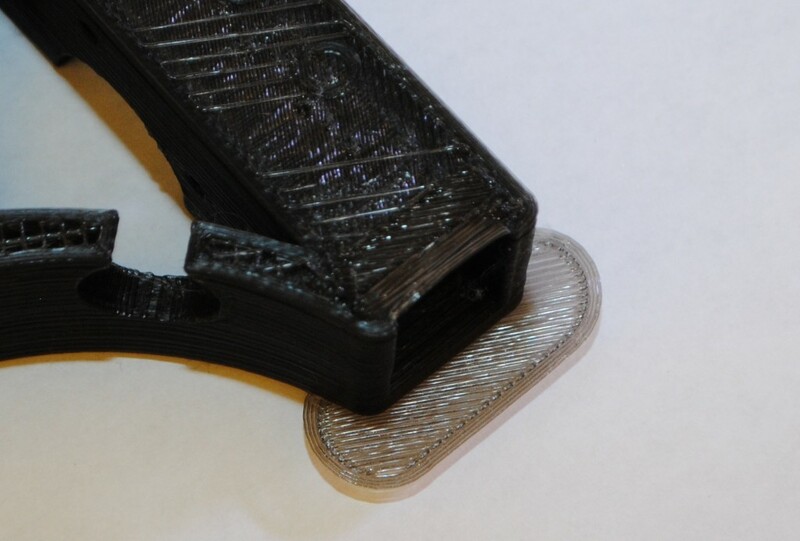 Keeping the parts in the heat-deflection range ensures that the part remains flat on the print bed. Heat beds, in combination with other tools to increase adhesion, will be covered in this article to bolster your ability to fight unwanted effects and improve your printing quality. The following video shows what happens with no heat bed and no adhesive added to the glass. 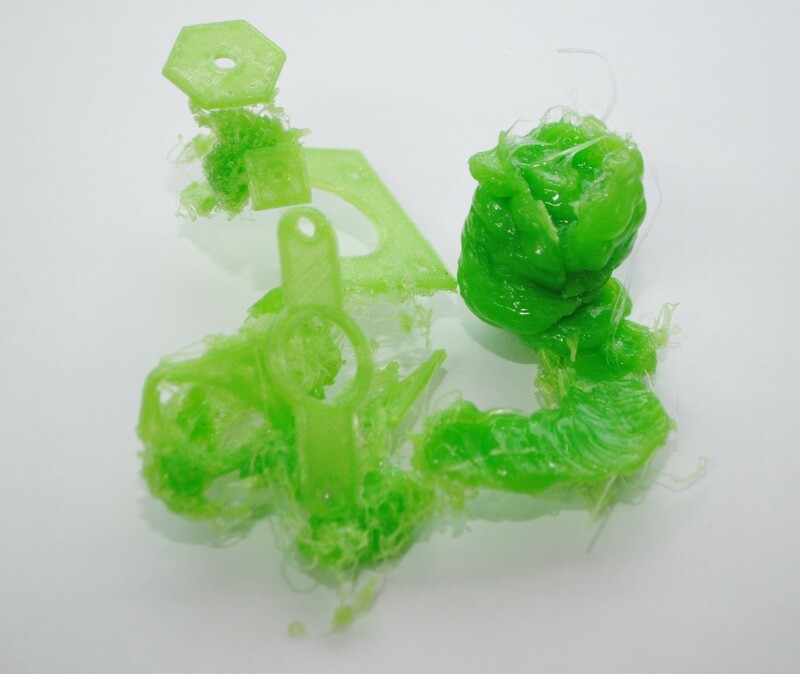 It depicts what can typically happen when printing on a non-sticky platform with no heat bed – Disaster! No heat bed, print stuck to the extruder. Disaster! No adhesive used; a dramatic result and wasted PLA! There are several types of heat beds & heating elements. 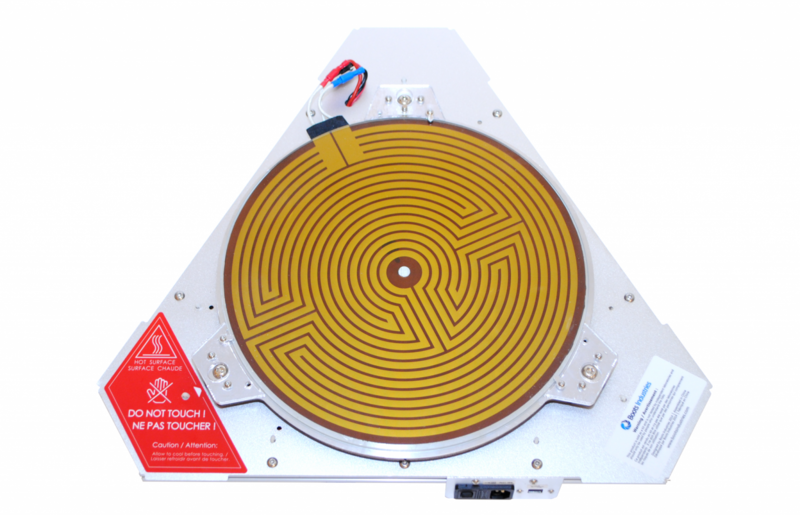 We specifically discuss the PCB heat bed, the polyamide film heater (kapton film heater) and the aluminium clad heater. You can find a more exhaustive list of heater types here. 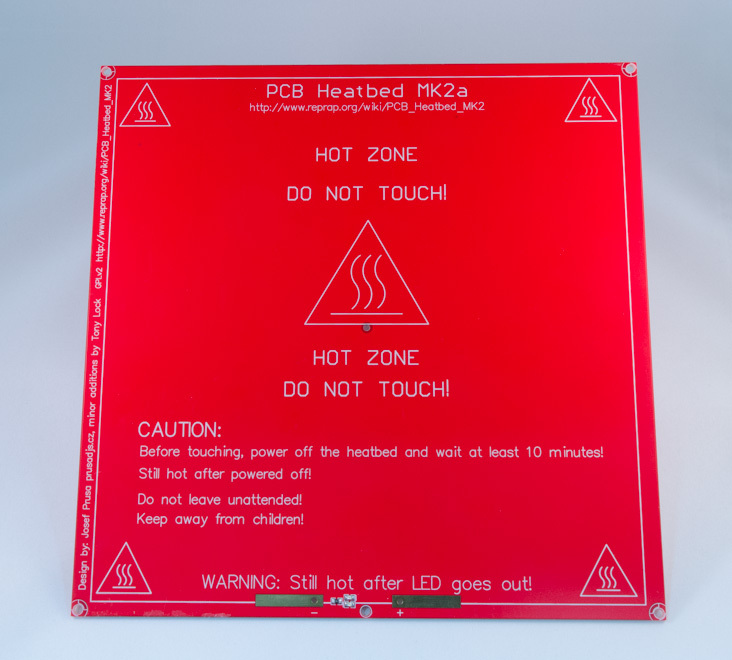 The MK2A heat bed (200mm x 200mm) is a good example of a PCB heat bed. These heat beds are used by many 3D printers and our own (Rostock V1.0) due to their great performance and affordability. 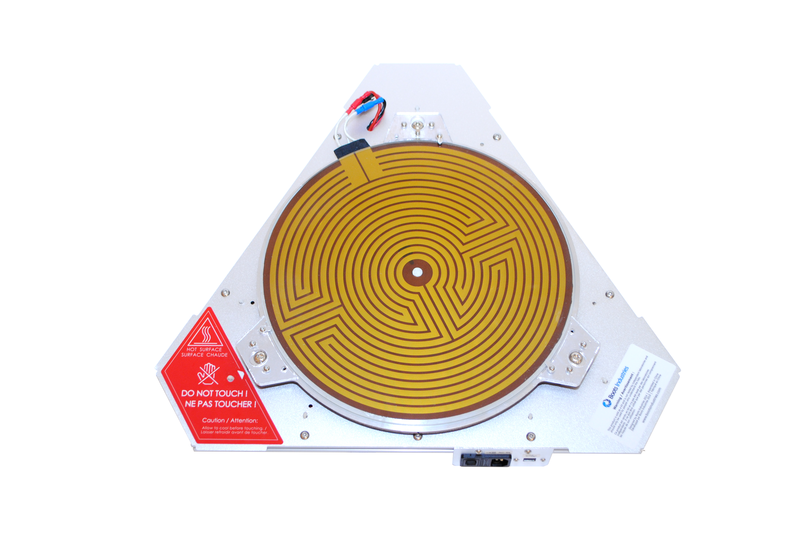 This particular heat bed has 2 integrated LEDs and an integrated resistor which makes it rather ‘plug and play’ when compared to other solutions. You can generally expect a simple & clean implementation with these heat beds thanks to the 5 holes available for leveling and installation purposes. They require little vertical clearance when compared to a stainless steel sheet mounted with aluminium clad resistors and offer an even heat distribution. The cons is that they can be slow to heat up especially when used with another surface such as a glass pane. Kapton or polyamide is well know as a tape of choice for print surfaces, because of its heat resistance, smooth finish and high adhesion for PLA. Now think about two films of polyamide with a heating element sandwiched in between, now you have a polyamide film heater. Obviously, these are very thin, easy to install with an adhesive back, reliable and heat really fast. They have an integrated thermistor and are provided, unlike the PCB heat bed, in an unlimited variety of shapes. For these reasons, this is the type of heater foil we use on our latest 3D printer (BI V2.0). This type of heaters is both very efficient and inexpensive, but they require more installation steps than the last two heat source we’ve discussed. As a matter of fact, they need to be screwed onto a surface, normally a stainless steel or aluminium plate. 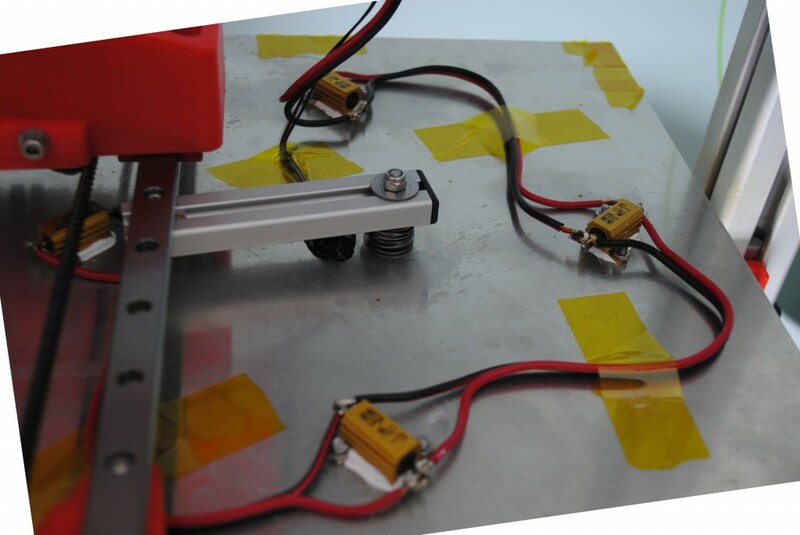 Then, the electrical circuit needs to be completed with a thermistor and an insulator if you have any temperature sensible elements under the print bed. Finally, it’s also a good idea to use thermal paste between the clad heater and the surface to be heated. All the heat sources mentioned in this article will typically need an added surface to preserve the quality & integrity of the heating element over time or to provide protection in the event of a hotend collision. Obviously, the aluminium clad heaters are always used in conjunction with a surface. The recommended print surface to be used with a PCB or Polymide film heater is a borosilicate glass, or when unavailable, a tempered glass. 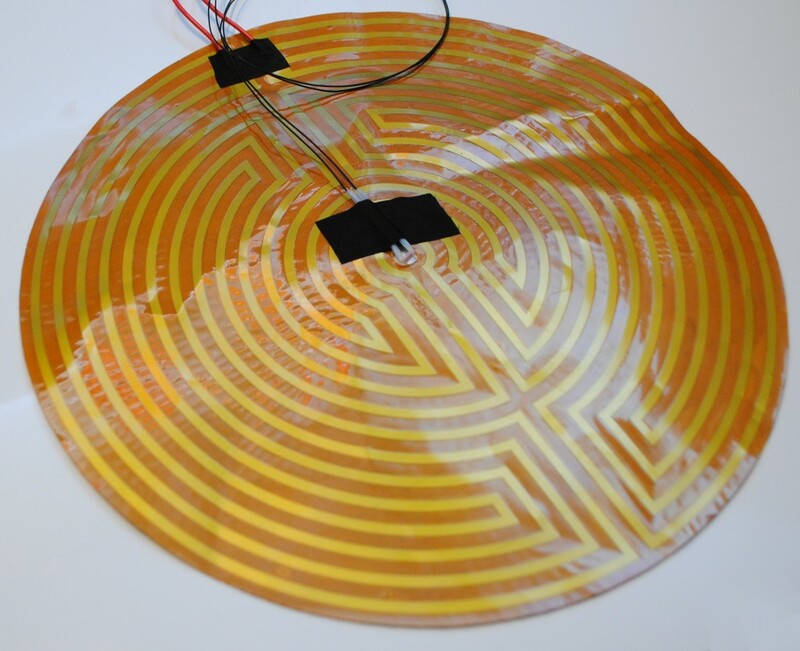 For the PCB heat bed, we recommend layering Kapton tape or using a thin glass (2 mm) over-top. In addition to a heat bed surface, most users will experience that some form of adhesive or method is required to make PLA or ABS stick properly. This is where Kapton tape, painter’s tape, glue or hairspray comes into play. Painter’s tape is an ideal product for printing ABS with a heat bed because of it’s textured surface increasing adhesion. We’ve used it with varying degrees of success and others report great results as well. As far as PLA is concerned, our experience is that it doesn’t stick well to heated painter’s tape and that painter’s tape itself doesn’t stick well to the glass when heated. However, we found that PLA sticks very well to Kapton tape which is typically layered to cover the entire print area. The Kapton tape needs to be periodically replaced and this process can be tedious. 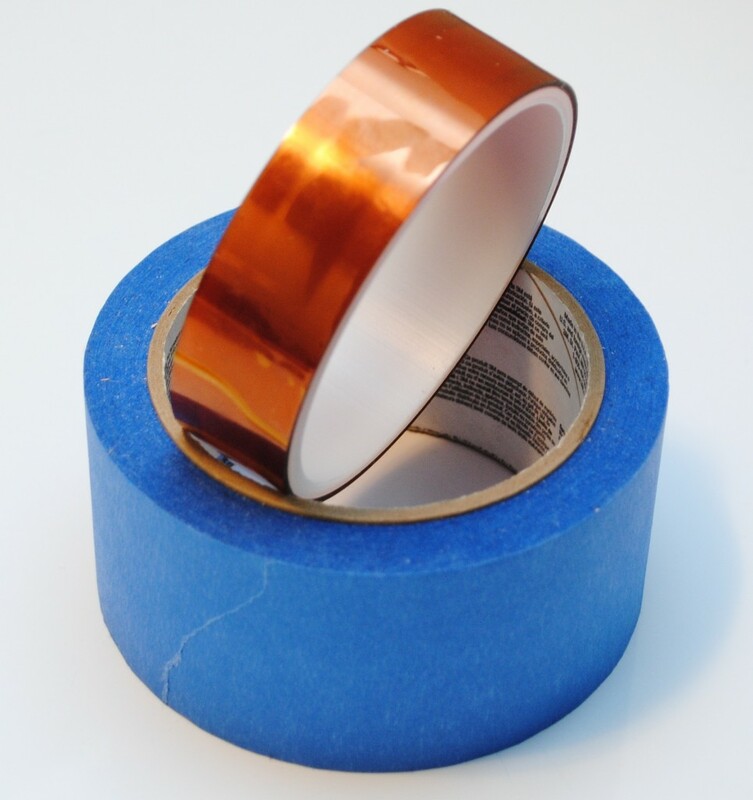 To remove this obstacle, you can buy Kapton tape in wider rolls which means you need to layer a lesser amount of strips onto the print area to fully cover it. Glues are frequently used to make sure your print “sticks” to the print surface. The most common glue we have seen is the typical arts and craft glue stick (Elmers). This technique works well with ABS in conjunction with painter’s tape. In the PLA department, we prefer to use hairspray on a glass surface. The glass surface is really flat and produces a really smooth finish for our parts. Another advantage of hairspray is that it can be applied in a few seconds and will typically create a thin film that strips away with the printed part or is easily scraped with a wood chisel or similar tool. Sometimes we use a wet rag to remove hairspray residue from the underside of parts when it’s not desired for aesthetic reasons. We recommend the PCB heat bed or Polyamide film heater in conjunction with a glass surface. For PLA we always apply a thin coating of hairspray and so far this simple combination has been producing great results. This entry was posted in 3D Printing, Electrical, Parts, Printing Technology and tagged 3D Printing, Heat Bed, Kapton Heat Bed.